No report from tonight’s meeting, as I am working in Albania for a week. But remember that there is an ESNG PlayDay on Sunday 10 May, 2-7pm, followed by curry. This is our third regular Sunday meeting – the first two have been very successful, so come along if you can. I haven’t seen any Albanian trains so far – being up in the mountains is not helpful. But the following suggests you will need to be more interested in scrap heaps than timetables! The first railways in Albania were mineral and military narrow gauge lines built between 1917 and in the 1930’s, some of these systems were extensive, but none remain intact today. The standard gauge system was opened in stages from 1947 to the 1980’s, mostly along the coastal plain. The route from Durrës to Podgradec is the only line to be built any distance into the mountainous interior. The only link with any other railways opened in 1984 as a freight only line between Shkodër and the border with Montenegro at Han-i-Hotit. This was out of use from 1991 to 1996 (closed by civil unrest and then UN sanctions on the former Yugoslavia) and from 1997 to 2003 (damaged from looting). Until in the 1990’s locomotives and rolling stock were obtained either as donations from, or barter trade with, Albania’s political allies. The Soviet Union donated some of the first steam locomotives, carriages were traded from China in the late 1960’s and diesel locomotives were obtained from Czechoslovakia in exchange for Albanian chrome ore. More recently Albania has acquired second-hand rolling stock from France, Germany, Austria and Italy. Some wagons and a few carriages were built locally in Shkodër. The railways suffered two periods of considerable damage due to civil unrest in 1991 and 1997. The Rreshën branch remains closed as the remaining track was used to provide rails to repair the cross-border line north of Shkodër. A Directorate within the Transport Ministry runs the railways. Until the mid 1980’s when Albania joined the UIC, the railway operator had no operating name as such. Since then the Directorate has used “HSH, Hekurudha e Shqiperise” as an operating name. Only the former DB locomotives, passenger carriages and some wagons carry HSH markings. Rolling stock is numbered in a national series. A few wagons are registered for international traffic and carry full UIC numbers. Almost all withdrawn locomotives and carriages from the 1940’s onwards were dumped in a derelict condition throughout the system. For the first time in HSH history, scrapping of some withdrawn stock has commenced. In the mid 1990s over half of the diesel locomotive fleet was placed into store, leaving only the T669.1 class in service. 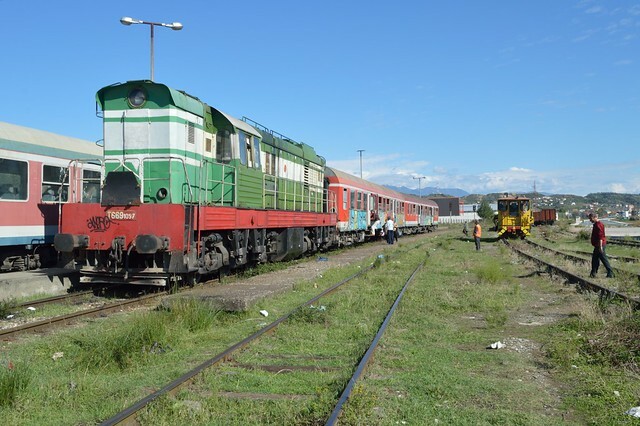 A number of wagons from other railways were trapped in Albania during the periods that the cross-border line was closed to traffic and they are to be found in a derelict condition at several locations. There were a number of industrial lines at works and mines, many of these are now derelict or dismantled and little is known about the full extent of these systems. From this site. But trains do have a real ‘short-line’ image, and are typical of the region. Update – no trains, but plenty of disused track! And in one location a siding of rotting diesel units, as the article above suggests. Unfortunately, work rules, so we didn’t stop for a look….